The letter from my late uncle’s nursing home invited me to a Saturday afternoon celebration of residents who had recently died. The celebration would involve releasing small, tagged helium balloons to represent the departed. 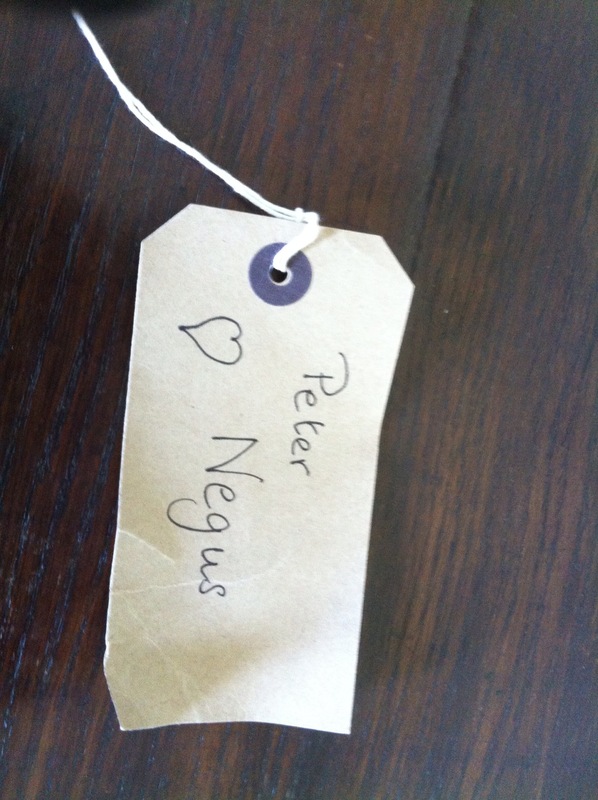 The letter enclosed a parcel tag bearing my uncle’s name, hand-written in black ink with a small line drawing – a heart? a balloon? a balloon shaped like a heart? Then there would be tea and cake and a chance to catch up with the staff “who played such a huge part in your loved ones lives”. The letter was from a Rev. who styled herself ‘Pastoral Coordinator’. I have been told at the university that the term Chaplain is no longer institutionally used as it is not widely understood. My uncle died nearly a year ago: the funeral and the scattering of the ashes were accomplished, and even the administration of the estate was nearly complete. Was this further memorial needed? It would be an opportunity to meet again some of the staff who had looked after him, and possibly some of the other relatives with whom I had exchanged a few words on my weekly visits. So I accepted the invitation. I arrived nearly half an hour after the appointed time of 2 o’clock – I had had a busy morning and the route included an unexpected traffic diversion. Nearly every parking space was taken, and a large paper sign directed me to the ‘Balloon Release’. This was in the dementia area, a collection of houses around a garden enclosed by high wooden fences. As I entered the building, I met Maureen, a care worker who had treated my uncle well. She looked more tired than I remembered. As I walked into the large room to which Maureen directed me, I saw that was full of white-haired, elderly people sitting in a large circle of chairs. I thought: there are a lot of residents in this room. Then people began to rise and walk through patio doors into the garden, and I realised: These aren’t the residents. These are the relatives. These are us. Outside, fifty or sixty chairs had been placed in a large rectangle, but the relatives were reluctant to sit down. There were numerous care assistants in their white uniforms and blue badges, some wheeling and walking people whose afflictions (despite the excellent human and technical provision) were distressing to themselves and their companions. One face was red and distorted in a grimace of agony; another, cadaverously grey and attached to a stooped shambling body, looked only at the ground. As the chairs became occupied by the staff and the infirm, the Rev. appeared, distinguished by a clerical collar and a denim skirt. With an assistant, she carried a large curtain containing the balloons. I still carried the parcel tag in my pocket: it was now too late to attach it to its helium elevator. With scarce announcement, the curtain was opened and the balloons rushed into the air, as if seeking heavenly escape. Relatives clapped. The Rev. announced: tea and cakes are available in the clubhouse “if you want them”. So that was it. I looked round and recognised no-one except one or two of the care staff. Perhaps, if I had arrived earlier, I would have felt part of the group, but nothing now held me there except perhaps the tea. But the cakes were the same as I had experienced on my regular visits, and I looked for the way out. Every door was security locked with a pin-pad, and I was beginning to feel anxious when I saw a care worker whom I knew and liked. She recognised me and remembered my uncle’s name, and we had a warm conversation as she led me along the corridors towards the main exit. As I left, I had a welcome feeling of self-respect. I had attended the ceremony in memory of my uncle, and I had spoken with the two care workers whom I most liked. And I had spent no longer at the ceremony than I wished. I turned the car up the congested weekend motorway.